The atmosphere creates mood and drama in the world around us. It brings a softness to the landscape which simplifies the chaos and quiets the sounds. Sometimes it makes the light shining through take on different colors as the light reflects through it. We have an atmosphere in ourselves. When you walk into a room, you bring with you a glow of light which reflects peace and calm or thunder and lightning, and many other metaphorical possibilities. Sometimes, however, something will sneak into our surroundings which stands out and surprises the soul. A bolt of lightning can strike, and we are terrified, or a cool breeze can blow over the sweat on our shoulders, and we are comforted. 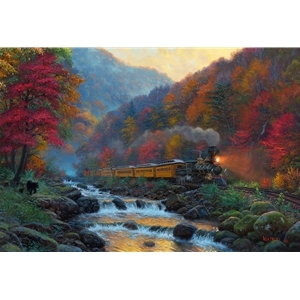 One day while out painting a river scene in the mountains, this train just appeared right up close behind me. I had been looking the other way at my landscape setting, while it was coasting downhill - not wasn’t making enough noise to break through the heavy mist that was encompassing the landscape. It was a grand moment, which I only captured with my camera, but determined to recreate it for you in this grand setting from the Smoky Mountains. The smoke from the stack, the steam from the boiler, and the fog all around came together in a magical atmosphere and the first in a series of train paintings - Smoky Morning.